For the battle between the Bulgarians and Byzantines, see Battle of Dyrrhachium (1018). For the battle between the Normans and Byzantines, see Battle of Dyrrhachium (1081). The Battle of Dyrrachium (or Dyrrhachium) on 10 July 48 BC was a battle during Caesar's Civil War that took place near the city of Dyrrachium (in what is now Albania). It was fought between Julius Caesar and an army led by Gnaeus Pompey who had the backing of the majority of the Roman Senate. The battle was a victory for Pompey, albeit not a decisive one. The battle preceded the Battle of Pharsalus which was the decisive battle of the Civil War. By the end of Julius Caesar's first year as consul he had accumulated a large list of lawsuits. Roman law gave government officials immunity from prosecution but only during their term of office when they held lawful Imperium. Once he became a private citizen Caesar knew he would be vulnerable. Instead, as was usual for a consul at the end of his term, Caesar obtained a proconsul position, or governorship, over the territories of Cisalpine Gaul and Illyricum, with the later addition of Transalpine Gaul. What was not usual was the length of Caesar's term as proconsul, which was for five years instead of the usual one year. Moreover, prior to the end of his five years as proconsul of Gaul and Illyricum, Caesar assisted his allies Crassus and Pompey in being elected consuls, who in turn extended his pro-consulship for a further five years. At the end of his term as proconsul, having now met the condition that there be a minimum of ten years between elections as consul, Caesar intended to stand for the consulship in absentia, and upon being elected go straight from his proconsular command into the second consulship. In this way, he would maintain his imperium and thereby not be vulnerable to lawsuits. However, the Senate ordered him to resign command of his army. Caesar replied that he would agree to resign his military command only if Pompey followed suit. Offended by Caesar's response, the Senate demanded he immediately disband his army, or be declared an enemy of the people. In 50 BC, at his Proconsular term's expiry, the Senate forbade Caesar's standing for election in absentia for a second consulship and because of this, Caesar thought he would be prosecuted and rendered politically marginalised if he entered Rome without consular immunity or his army. Caesar responded by marching on Rome and he forced the unprepared Pompey and his allies to flee to Greece, starting the Great Roman Civil War. Caesar did not immediately give chase to Pompey and instead consolidated power in Rome and Italy. He had other problems as well; Pompey had left him with no ships to cross the Adriatic, and Spain had begun to mobilize against Caesar. After gathering the remainder of his forces from Transalpine Gaul he marched into Spain and subdued enough of the country so that it wouldn't intervene during his campaign against Pompey. He then turned his full attention to Pompey. Having only assembled half the needed ships, Caesar decided to take seven available legions across the Adriatic, and to then have the ships travel back to Brundisium, (modern-day Brindisi), and transport the remaining legions once they had arrived at Brundisium. Travel across the Adriatic Sea to Greece would ordinarily be tricky, but was made more so given that it was winter. However, this situation did assist Caesar because the Adriatic was sufficiently treacherous to deter the war galleys of Pompey's fleet, commanded by Caesar's former co-consul Marcus Calpurnius Bibulus, at Corfu. As it was winter Bibulus was unprepared and Caesar was able to sail through the blockade easily and form a beachhead at Epirus with the first half of his army. Bibulus, however, was able to block Caesar's attempt to sail his reinforcements stuck at Brundisium. Bibulus died while conducting this blockade and no overall naval commander was appointed by Pompey. At some point Lucius Scribonius Libo attempted to make the blockade more secure by seizing the island off Brundisium preventing Caesar's reinforcements from sailing anywhere. However, Libo could not sustain this position because of a lack of water. Caesar's blunder had put him in the worst possible position any army could find itself in. His army had no way to resupply from Rome due to the naval blockade, he couldn't resupply locally as Greece was pro-Pompey and closed their gates to Caesar, and his army was only at half strength. So dire was his situation that he made several attempts to discuss peace with Pompey but was refused at every channel. Realizing he was going to have to fight his way out, he attempted another winter blockade run back to Italy to lead his remaining forces to Greece. His luck was not with him and the rough seas and storms forced him back. However, his Master of the Horse Marc Antony fired up his troops and after several attempts evaded Libo's blockade and managed to land at Nympheum (Shëngjin) with four more legions. It was now a race against time as both Caesar and Pompey rushed to meet Antony. Although Pompey reached Antony first Caesar was right on his heels and Pompey prudently moved his forces to Dyrrachium to prevent becoming caught between the two forces. Dyrrachium was a strong defensive position for Pompey. His back was guarded by the sea, and at his front there were hills that commanded the immediate area. This made an assault on the position nearly impossible. Caesar instead decided to revisit his Gallic Wars play-book and ordered his engineers to build walls and fortifications to pin Pompey against the sea. Pompey responded with walls and fortifications of his own to prevent any further advance. Between these two fortifications a no man's land was created which saw constant skirmishes with little or no gain—similar to the trench warfare of World War I. Caesar held the outlying farmland but it had been picked clean and Pompey, with the sea at his back, was able to be resupplied by ship. However, as the siege wore on, their positions began to change. Pompey found it difficult with the limited land he controlled to create enough fodder for his horses, and other supplies such as fresh water became more and more difficult to maintain. The autumn harvest was approaching and soon Caesar would have enough food to prolong his position. This caused Pompey to become desperate to break out of the siege. By midsummer, though, Pompey had a fortunate stroke of luck. Two Gallic noblemen were caught stealing the pay from auxiliary cavalry under their command, but managed to escape to Pompey. With these two men on his side, Pompey was able to discover the weakest point in Caesar's wall. A section to the south of the lines hadn't yet been completed and it was the only viable target for attack. 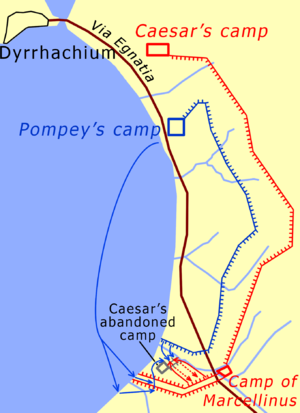 Pompey mounted an attack of six legions against Caesar's line where it joined the sea and where the IX legion was stationed. Pompey also sent some auxiliaries and light infantry to attack by sea. Heavily outnumbering the Caesarian troops, the Pompeian troops broke through the weakened fortifications, causing the Ninth to pull back from the onslaught with heavy losses. Caesar swiftly reinforced the breach with 4,000 men. Twelve cohorts under Mark Antony then counterattacked, re-securing part of the wall and pushing Pompey's disordered forces back. Although Caesar's counterattack was initially successful, Pompey's forces were simply too numerous. Some days earlier Pompey had occupied a small camp that had been abandoned by Caesar, and enlarged the defences. Caesar responded by sending 33 cohorts to attack this position. Although the attack was initially successful, the Caesarian troops were outnumbered 2-1 and Pompey's troops fought hard. Pompey sent a large force of infantry and 3,000 cavalry to outflank Caesar's right wing. Caesar first ordered his troops on the right to stand firm, but then saw the danger of being outflanked. He ordered a retreat which soon became a panicked and disordered rout. The counterattack on Pompey's camp disintegrated completely. At first Caesar personally tried to stem the retreat, but the fleeing troops did not stop until they reached their own camps. After the failure of the counterattack and considering the losses incurred, Caesar resolved to give up attempting to besiege Pompey and to change the entire strategy of the campaign. Pompey ordered a halt, believing that Caesar had been decisively beaten, and also suspecting a trap. According to Plutarch, Caesar remarked on that decision saying, "Today the victory had been the enemy's, had there been any one among them to gain it." Caesar, by various stratagems, managed to retreat south with the remainder of his army and avoided being caught by the pursuing cavalry of Pompey. He sent some of his cohorts to reinforce the garrisons of Apollonia and Oricum, and propelled the bulk of his remaining troops into Thessaly. The Caesarian general Gnaeus Domitius Calvinus and the Pompeian general Scipio Nasica were both in that country with their respective armies, and both Caesar and Pompey then aimed to link up with their corresponding forces in Thessaly. Upon entering Thessaly, Caesar captured the town of Gomphi and regrouped with Domitius, allowing his men to resupply, rest and then move towards Pharsalus, where the decisive battle would soon be fought. ^ 1,000 according to Caesar himself, 1,000 according to Plutarch in his Life of Caesar but 2,000 according to the same author in his Life of Pompey. 4,000 according to Orosius. Some sources might have taken into account the Caesarian prisoners killed after the battle. ^ "Battle of Dyrrhachium". UNRV. Archived from the original on 11 June 2011. Retrieved 19 June 2011. ^ Plutarch Pompey 65.5, Dryden translation: p. 465.